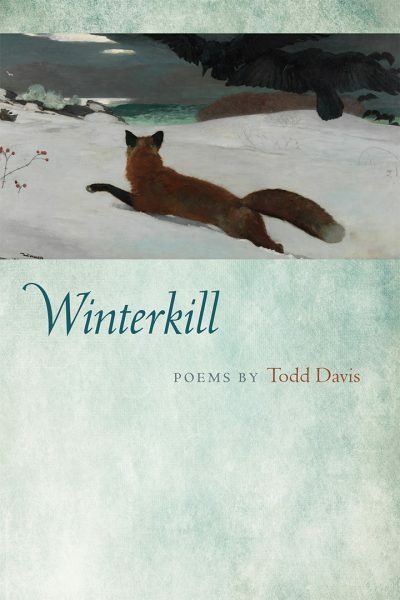 In Todd Davis’s Winterkill, all things—from the death of a father to Roman Catholicism—follow patterns set by nature. God is an animal, a truth reflected in both the food chain and the liturgy of the Eucharist. And when rivers disappear under mountains, they’re just following the patterns of fish darting under riverrock. Spirit of this fish’s colors. Davis is not the first poet to find awe in a trout stream or tree stand. With nods to Jim Daniels; Jim Harrison; and Tang dynasty poets Tu Fu, Po Chu-I, and Han Shan, his newest collection is rooted in a tradition spanning centuries and continents. And yet, like the melting snow that bares “the bones of animals that starved” in the titular poem, Winterkill remains a revelation. Bsided: Your poem “Burn Barrel” was Broadsided a little while back, and it appears in this collection as well. Although we’re sure that the broadside has already been tacked up in some interesting places, where would you love to see it show up in an ideal world? TD: I’ve lived most of my life in the Rust Belt, on the outskirts of factory towns and railroad towns where farms run against the remnants of forests. Many people who grow up in these areas are unaccustomed to poetry. I think poems should be a part of all our lives. I’d like us to live in the democracy of poetry. To that end, in an ideal world, I’d love for the broadside of “Burn Barrel” to be tacked up in taverns and on the corkboards in diners and taped to the window of the hardware store and the bait shop and the barber shop and the daycare and the bakery, etc. Bsided: Aside from concerns that remain the same (like the capriciousness of nature and the heat death of the universe), do you approach writing about, say, Montana differently than about somewhere closer to home? TD: I tend not to be able to write about a place until I’ve spent significant time in that place. I still must recognize that I’m writing about the place as an outsider, but I cannot write as a facile tourist, and the places I tend to visit aren’t exactly vacation destinations. For example, when I go to Montana, I stay in a room above a gas station in a small village that has a general store and a breakfast/lunch diner. The population for this town is 71 people. When I say “significant time” I mean not only the number of days, hours, or months in a place, but what I’m actually doing while I’m there. I don’t feel like I know a place until I begin to learn the flora and fauna, the behaviors of the human and non-human residents. Many people, when they visit some place new, set out to see several things once. I’m the kind of traveler who visits a new place and sees only a few things but sees them over and over, walking the same section of stream again and again, or the same mountain path. I’ve been visiting a particular region of Montana over the past decade, and I’ll be headed there again with my sons this July. There are two remote mountain streams where we fish for cutthroat trout. I’ve probably spent more than 400 hours on this particular stretch of water, about 4 miles of stream, and when I’m home in Pennsylvania I continue to think about certain bends and pools. When I get to the point where the stream is part of my waking and dreaming, even when I’m a thousand miles away, then I can write about it. Bsided: Many poems in Winterkill express guilt over the taking of animal life. Do we shed that guilt or carry it with us? If the latter, what balances guilt out enough that we can still walk into the deer woods every year? TD: The “guilt” that manifests itself in some of the poems in Winterkill is symbolic of a larger guilt at the way we treat the planet, the way we abuse it and extract what we want from it, with no thought of reciprocity. I put “guilt” in quotation marks because I’m trying to move beyond a simplistic idea of guilt to embrace the fact that I must eat, that I am an animal, too, that as an omnivore I play a part in the ecosystem. But what debt do I owe to the plants and animals whose lives are given for mine? How is the act of taking the life of a plant or animal a sacred act? How do I prepare for such moments? How do I honor the life after taking it? These are all questions I continue to struggle with. In my previous collection, In the Kingdom of the Ditch, I write, “to take a life is to live with that life until your own death,” and I mean that both spiritually and physically. I’m interested in the transformation of energy and how as we eat we consume the energy of other living things, transforming them into our own bodies. In this way those lives live on in me. I hope in death my body is taken back into the world and other creatures eat me, consuming my former self.